This workbook will help you identify and act on the possibilities in your life by assisting you to recognize what is hold you back, to face the fear of saying yes, and to take the first step to expand the horizons of your life. When we ask Why did this happen? Or Why don’t things ever work out the way I want them to? We are shaking our fist at the sky, ranting at the unfairness of life. When we start to ask What if and Why Not, we being to relax our fists into uplifted, open hands that can hold new possibilities. This book is not meant to be read like a novel. It’s a tool. It’s a series of questions that you, and only you, can answer. No one else has had your experience in life; no one else has lived your life. You are unique. So no one else can answer your questions for you. The search is part of the answer. This workbook is set up in chapters, with each chapter addressing a question. Working through this journal/workbook is intended to take time. It’s helpful to limit yourself to one chapter at a time, maybe even one journaling activity at a time, and then think about it for a day or two or even a week or more before going on to the next exercise or chapter. It’s important to let the questions and the answers rattle around in your brain and in your memory and thought and heart. There’s no race to get to the end of the book; in fact, you may find you pick it up for a while and lay it down and then pick it up several weeks or months later. There’s no right way to use this book, just some suggestions. You will learn easy, fun and creative journaling techniques such as little lists, timed writing, symbolic thinking, flow writing, dialoguing and non-dominant handwriting. All of these techniques are tools you can use to think through any type of questions of issue or just use in day-to-day journaling. Learn 15 journaling techniques which will have you asking and answering 10 simple, but life-altering questions. These questions and the 19 journaling exercises that you complete will introduce new ways of thinking about your past, present and future. 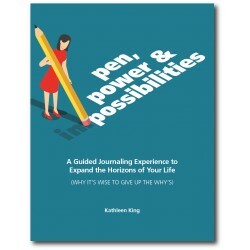 Master journaling techniques such as as little lists, flow writing, unsent letters, personal timelines, symbolic thinking, montage, timed writing and dialogues. Ask simple, but powerful questions including: What if? Who am I? Where am I? How am I limiting myself? Why Not? This self-paced workbook is 120 pages. Each journaling exercise is explained and an example given. There is space to write, as this is a guided journal, but you may want to buy a companion journal to write in if you run out of space or if other questions, thoughts or ideas come to mind that you want to explore.